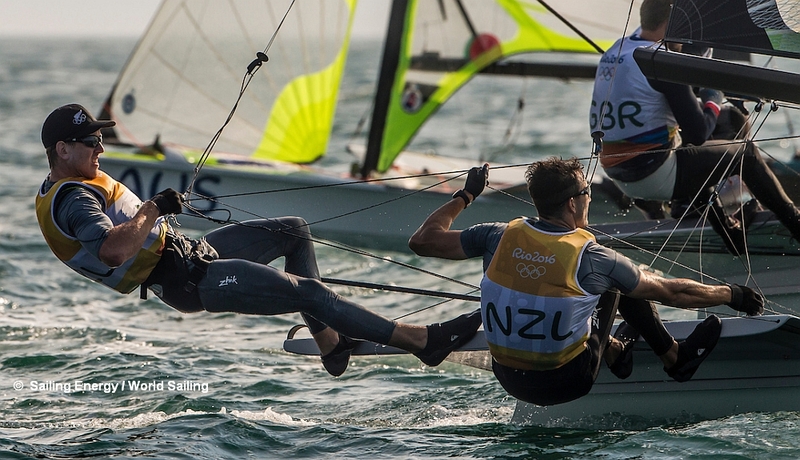 Defending Olympic 49er champions Pete Burling and Blair Tuke will start their Tokyo 2020 campaign at the Oceanbridge NZL Sailing Regatta this weekend. While the rest of the worlds top rated 49er crews are competing at the Hempel World Cup in Miami, USA, the Kiwi pair will test the waters of Okahu Bay, New Zealand against other local NZL teams. Four-time 49er world champions Burling and Tuke have been out of International 49er racing since the Rio Olympics, but keeping busy competing in the America’s Cup and the Volvo Race. While they were away two Kiwi teams, Logan Dunning-Beck and Oscar Gunn, and Josh Porebski and Trent Rippey have been making their mark. Josh Porebski has been a top competitor in the 18ft skiffs in Sydney recently, and also won the 18′ Skiff NZL 2019 Championships. Dunning-Beck and Gunn qualified New Zealand in the 49er for the 2020 Olympics at the 49er World Championships in Aarhus, Denmark, so all eyes will be on this first meeting of the rivals. The Oceanbridge NZL Sailing Regatta is New Zealand’s premier Olympic and youth classes regatta, and is hosted by the Royal Akarana Yacht Club over three days from Friday. The Royal Akarana Yacht Club will also host the 49er, 49erFX and Nacra 17 world championships at the end of the year.